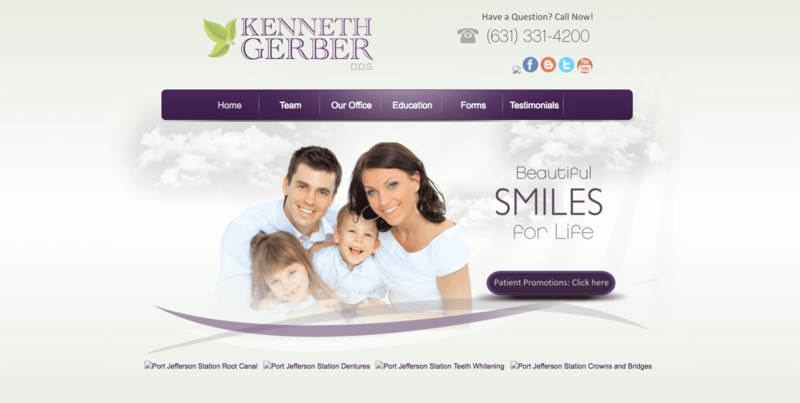 Dr. Kenneth Gerber manages the Kenneth Gerber Dentistry office in New York. Dr. Gerber and his team of doctors pride themselves on using the most advanced dental technology and creating the ideal office setting for any and all dental patients. The standout feature of Dr. Gerber’s office is their ability to do specialized dental procedures such as Invisalign, Lumineers, Snap-on-Smiles, and Six Month Smiles. These dental procedures are not available at most dental offices and give Dr. Gerber a step up from the competition. For Dr. Gerber’s website, we wanted to be straightforward and to the point. We went with a clear, traditional layout with marginal spacing. With all the special dental procedures available, there is no need for all the additional glitz and glam. The home page is home to the different services offered as well as a short mission statement about the dental office. We rounded out the home page with direct links to the special services to increase web traffic. To complement the specialty, we used a purple color scheme throughout the website. To match our personalized logo (located on the top banner, next to our stylized font, we went with a light green background. Purple ensures a sense of safety – we used this to highlight important features and call to actions on the website. Green ensures a sense of comfort and reliability. When used in conjunction, both purple and green create an approachable, laid-back, nature-like color theme for the website! Throughout the website, the spacing is expertly managed. The background helps establish borders and frames as needed. The images on the website are all reflections of the team’s work ethic and professionalism. No matter where you go on the website, the navigation bar is available. Navigating throughout the website is simple – you are no more than a couple of clicks away from getting anywhere you want to be. The education tab, in particular, is home to a variety of different informationals and blogs that help educate and answer frequently asked questions. There are also several patient information videos for visual learners as well. The testimonial tab brings you to a new page that highlights all the verifiable reviews Dr. Gerber has under his belt. Right next to the plethora of reviews, we also incorporated an appointment request calendar as well. Dr. Gerber understands that he has a special niche in the dental industry. He tried to help patients make ends meet by offering patient promotions. These promotions can be found on the home page and at the bottom of each web page near the contact information. Accessibility and convenience are two of the most important aspects that incoming patients look out for. Dr. Gerber offers new-patient forms on his website under the forms tab. To top it all off, the website is hack-free thanks to SSL Security. SSL Security protects important patient information by encrypting the information before sending it off to the database. This website reflects a company that believes less is more, incorporating vital information in each section of the site but never overstaying their welcome. It was designed with the idea that those clients who find their way to the site already know what they’re looking for and are not interested in a hard sales pitch. Instead, useful information is provided in a professionally friendly way using an attractive site that’s easy to use. Spacing and navigation is easy and accessible at all times!